The Big Yellow Angel is Back! 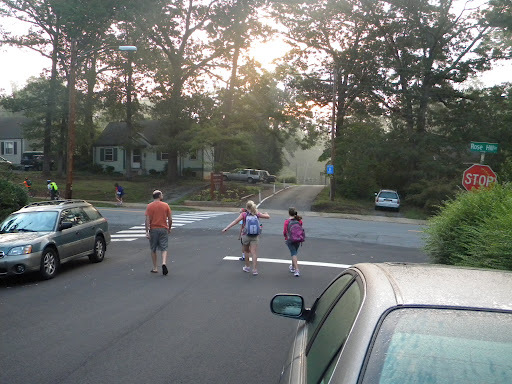 In our case, it came in the form of the neighborhood 10 year old girls knocking on the door at the ungodly hour of 7:25 (the hour to which we’ve been accustomed to getting ourselves out of bed most mornings for the last 5 years) to walk the two blocks to their new school. Which I realize is way later than every other neighborhood in town where the Walker bus comes through at the ungodly hour of 7 am. I am lazy and spoiled. But at least I admit to it. The Big Yellow Angel is a phrase I picked up from my friend Virgina. I fully embraced it after Edie’s first Christmas break back in Kindergarten, when I realized how much my child thrived on the structure she got at school all day. Structured I am not. She seemed to have a good first day yesterday – she’s been anxious about the change of schools for some time and I knew as soon as she actually got it over with she’d be in much better shape. Her BFF moved to Guatemala a few weeks ago, so a new school is not the only big change in her life. We’ve known about this added change since last Christmas. Waiting for them to both actually happen has been like very slowly pulling a band aid off. Now that it’s finally ripped off, we can move on and find her new normal. Thankfully, she’s got her crew of neighborhood girls that are right there with her, so she is in good company.